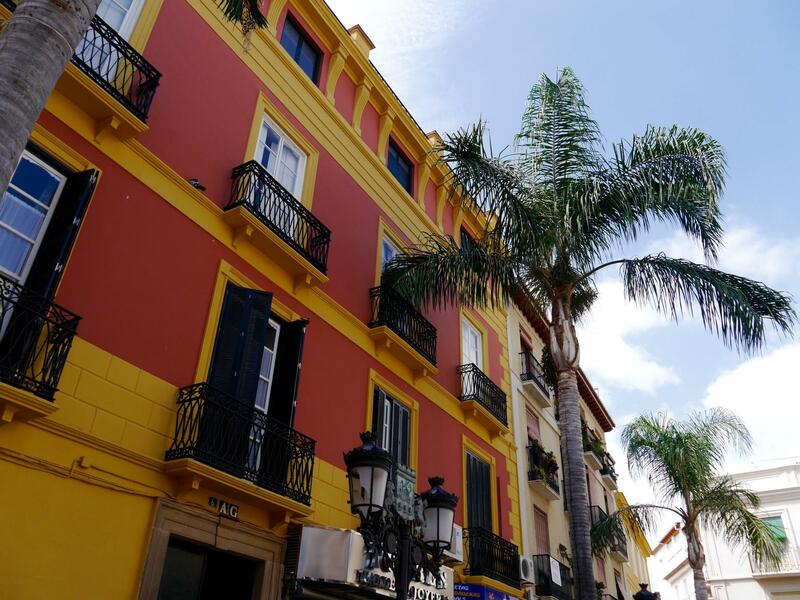 You might be surprised to hear that before I hopped on a plane for my latest trip, I had absolutely no intention of blogging about it and I definitely didn’t think I would end up writing 7 reasons to visit Almuñécar. For the past 2 years I have travelled almost every month for my blog, but this trip to Almuñécar was my first personal holiday in well over a year. 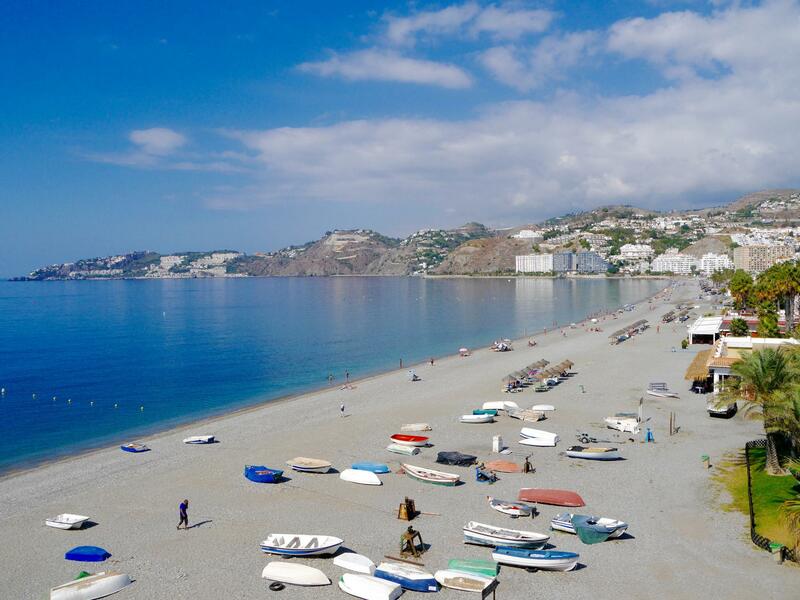 Almuñécar is located on the southern Andalucian coast of Spain and is 1 hour’s drive from Malaga Airport. Although it was only for 4 days, I was looking forward to travelling without the pressures of having to photograph every inch of my room before unpacking or think about how many tweets I had done that day. I knew that would come as refreshing change. 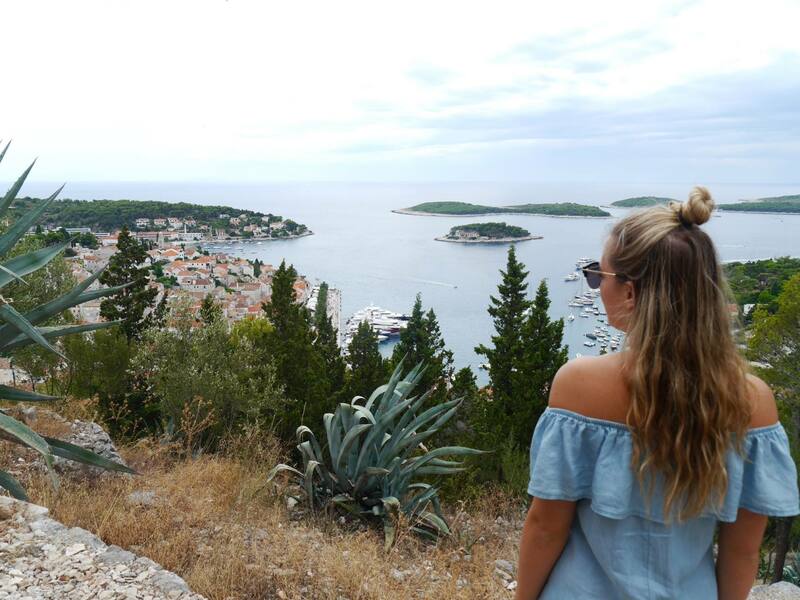 Don’t get me wrong, I absolutely adore travelling as a travel blogger and all of the quirks that come with it, but every once in a while it feels liberating to holiday just like everyone else. I love photography so still took plenty of photos, but didn’t feel the need to excessively post my every movement on social media or take a photo of every meal I ate. So why did I go to Almuñécar? 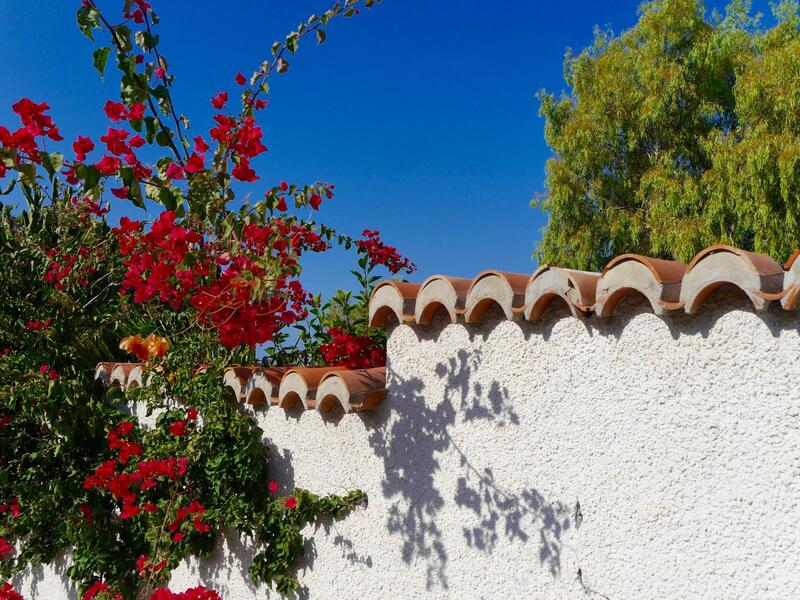 It was to join my family on their 2-week holiday where they were staying in a beautiful private villa. And why did I change my mind and decide to blog about it in the end? 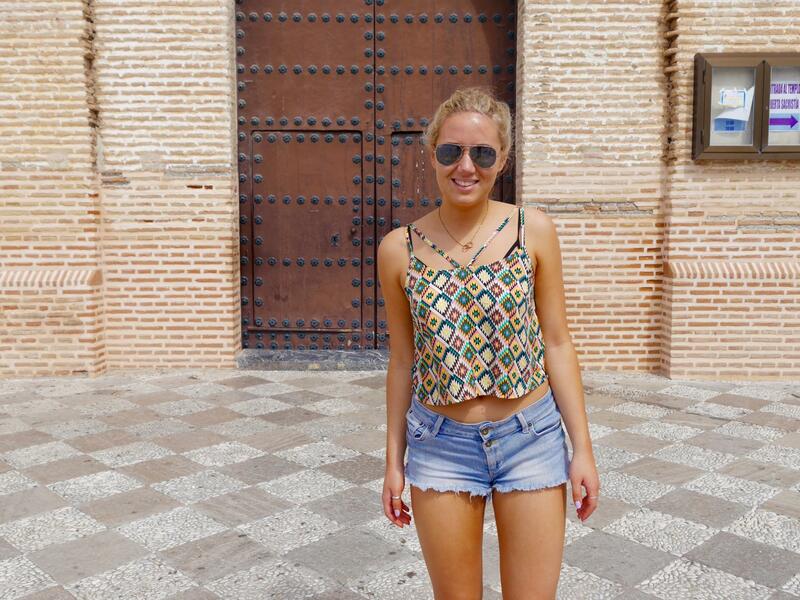 Because this trip made me fall in love with Spain again. 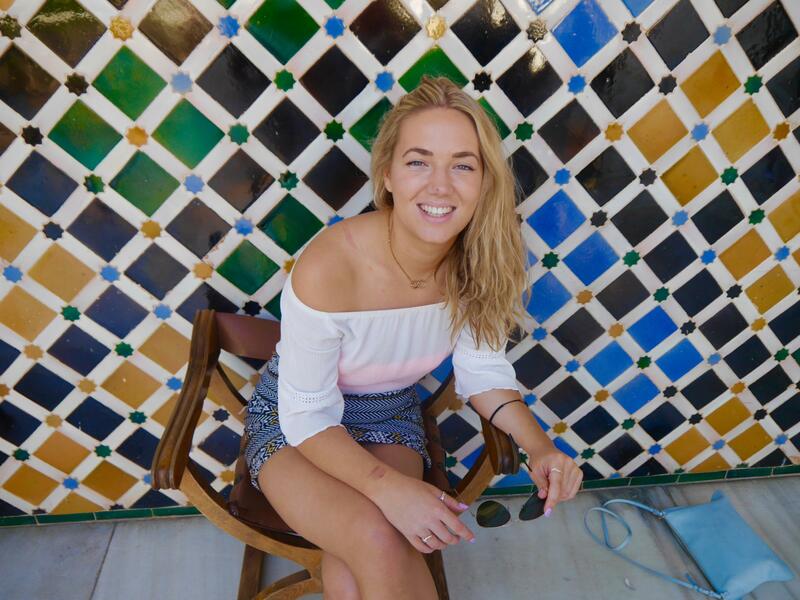 It opened my eyes to the fact that the South coast of Spain is still scattered with quaint, authentically Andalucian coastal towns that make for the perfect European hideaway. Almuñécar is one of them, and the experience was too good not to share. It goes without saying that ‘Sunny Spain’ has been a firm holiday destination for Brits for decades. So much so that lots of the Costa del Sol has developed an unfortunate stereotype of being overrun with Irish pubs, greasy spoons and lager lout Brits. Almuñécar couldn’t be further from this stereotype. 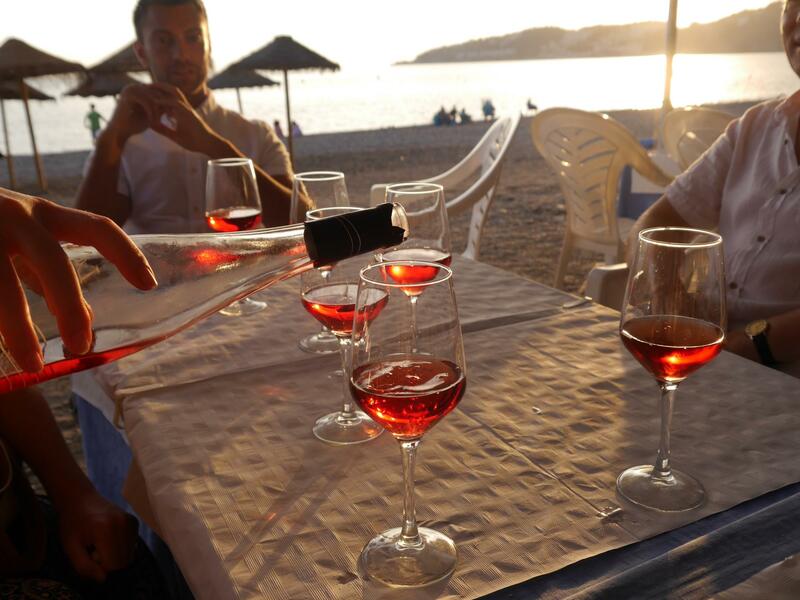 The seafront promenade is scattered with quaint seafood restaurants and tapas bars which feel like an authentic slice of Spain. The vast majority of the people in Almuñécar are Spanish, with a few French and only a handful of Brits. This is another thing I loved about it. 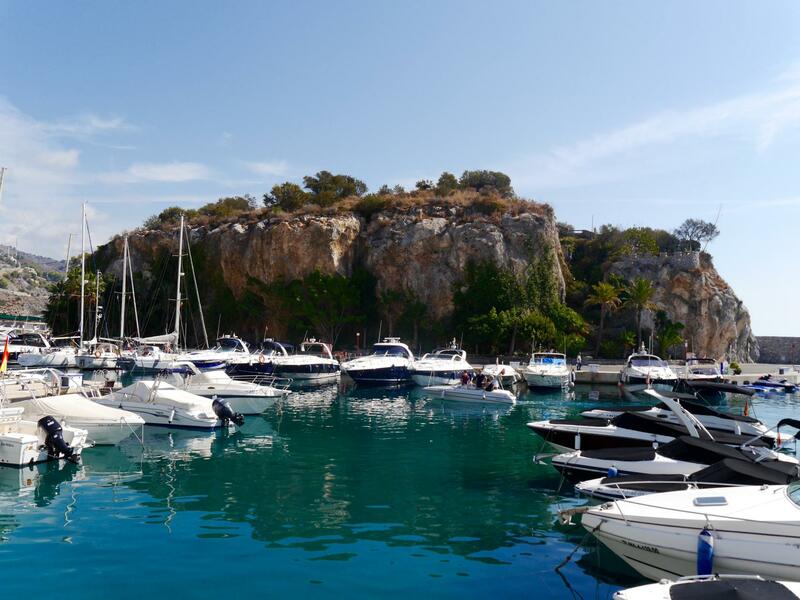 One of the best things to do in Almuñécar is to explore the surrounding coastline on a boat trip. 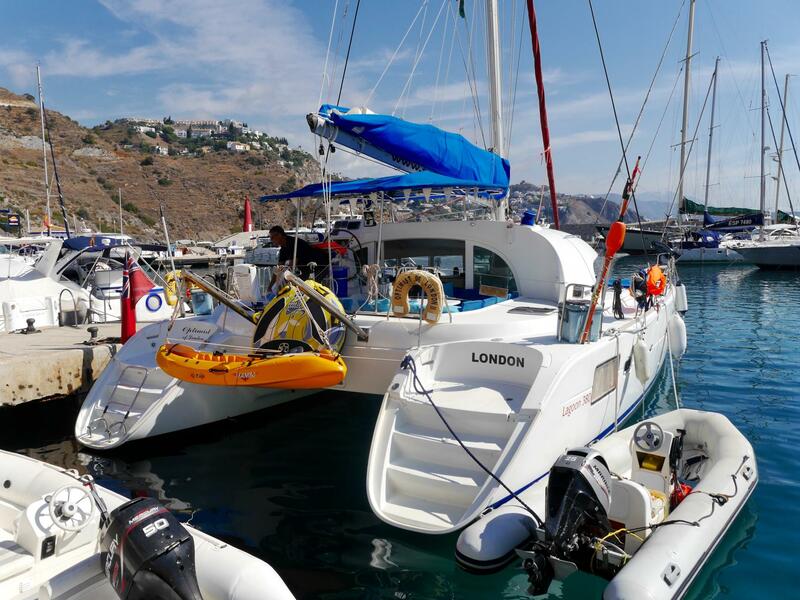 We had an amazing afternoon with Sail and Stay on their catamaran yacht ‘The Optimist of London’, which is docked in the Marina Del Esta in nearby Herradura. Because there was 6 of us, we had the whole yacht to ourselves and were looked after by 2 staff during the cruise, the skipper and the mate. 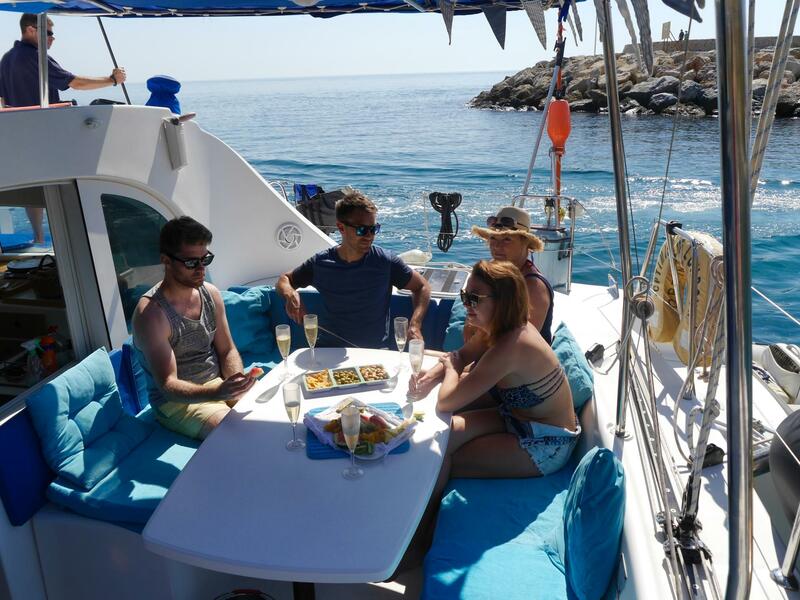 We spent a blissful 3 hours sailing down the coast to undiscovered coves and sunbathing on the catamaran netting. 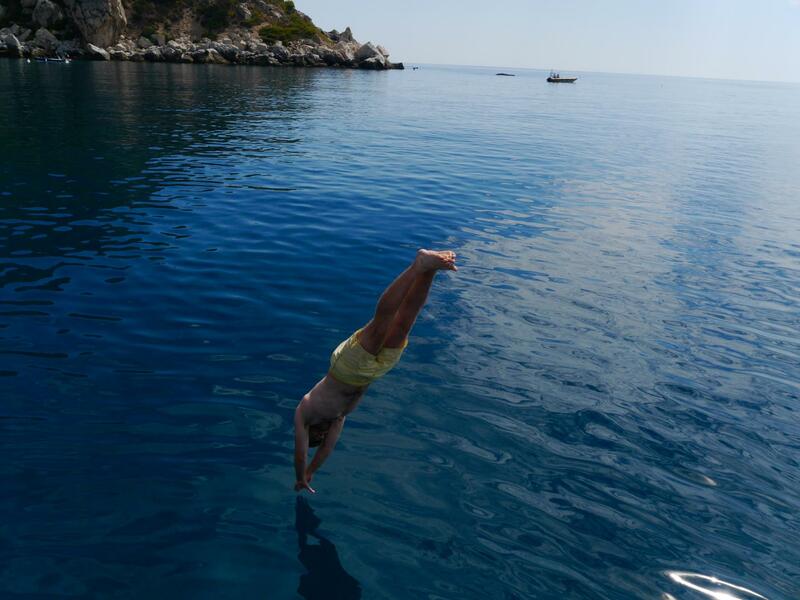 We dropped the anchor for lunch and all dived into the clear blue ocean, which really reminded of my Greek Sailing experience. 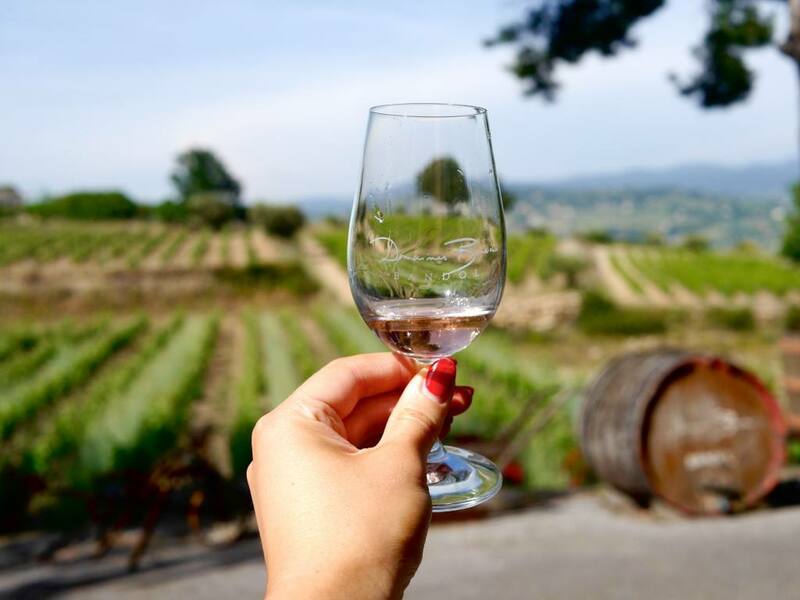 The cruise included a welcome glass of cava (which stayed free flowing throughout the sail) unlimited drinks, a delicious buffet lunch on board, donut rides for every guest, snorkelling equipment and an excursion to a smugglers cave and snorkleling bay. At 60 euros per person, the cruise was incredible value and I can’t recommend this experience enough. 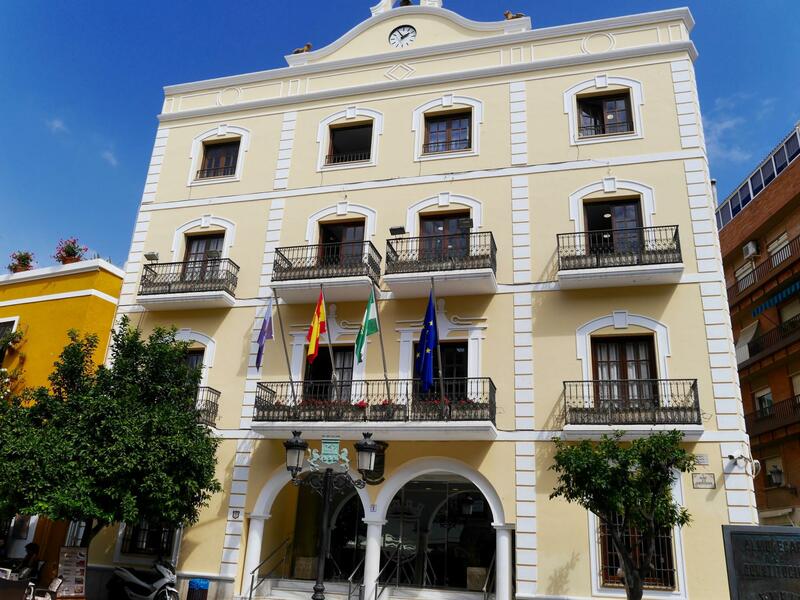 Everything in Almuñécar is incredible value. I was utterly gobsmacked at the price of things including drinks, restaurants and even clothes shops (if you live in London you will be even more surprised by the prices). Lots of the restaurants have a menu of the day, which includes a 3 course lunch / dinner with a glass or wine or beer for 10-15 euros each. 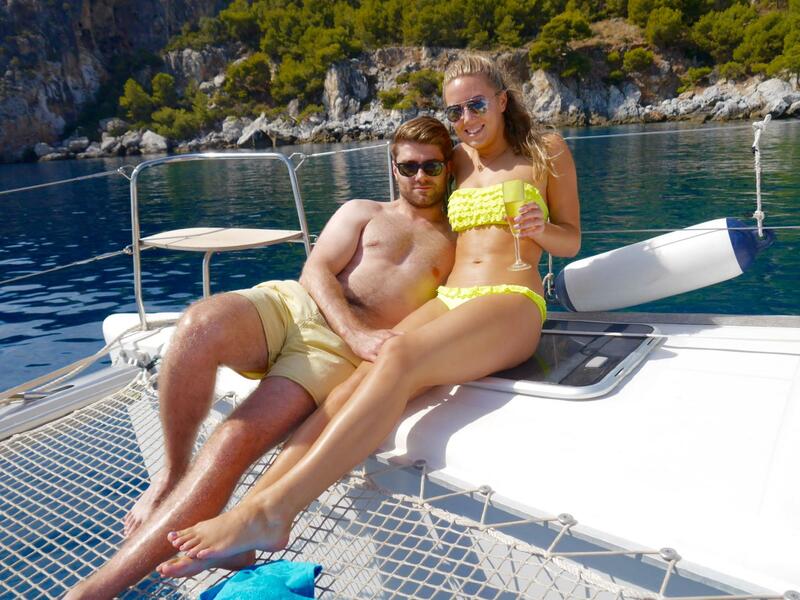 A couple can go out and eat like kings for less than 30 euros in total. And if you’re going self-catered, the supermarkets are incredibly cheap too. 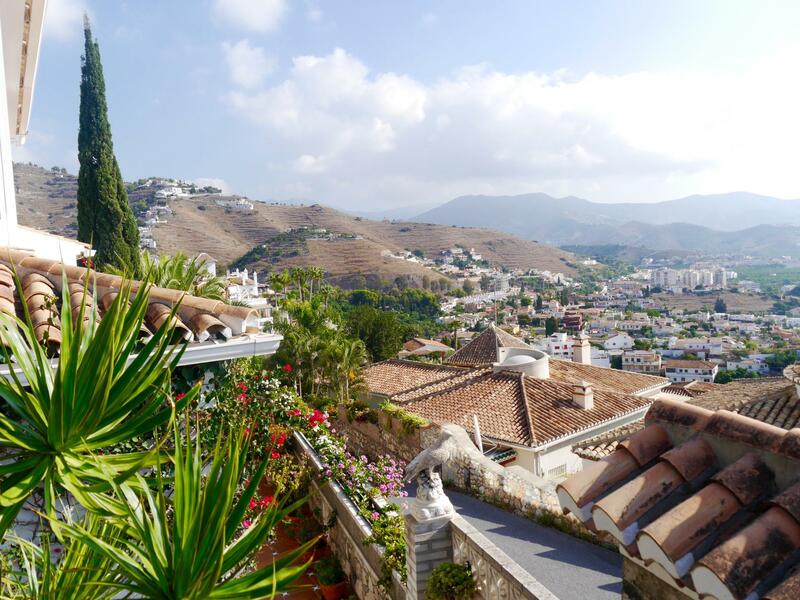 If you’re on a budget, Almuñécar is half the price of the surrounding coastal spots such as Marbella and Malaga. 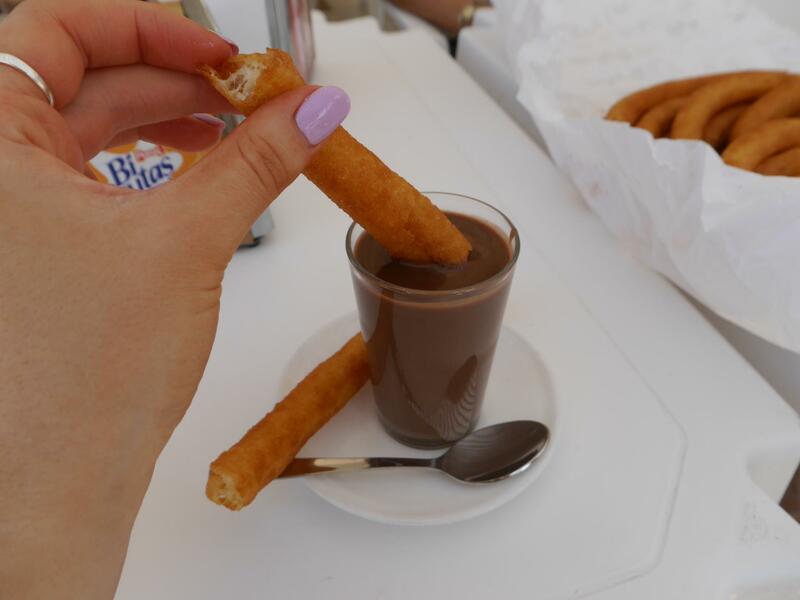 Almuñécar is worth visiting just for the Churros alone. They’re traditionally served for breakfast with coffee, but you can order them any time of day. For those of you that haven’t had churros, they’re like long deep fried donuts that are dunked in a warm and thick chocolate sauce. Utterly indulgent and divine. 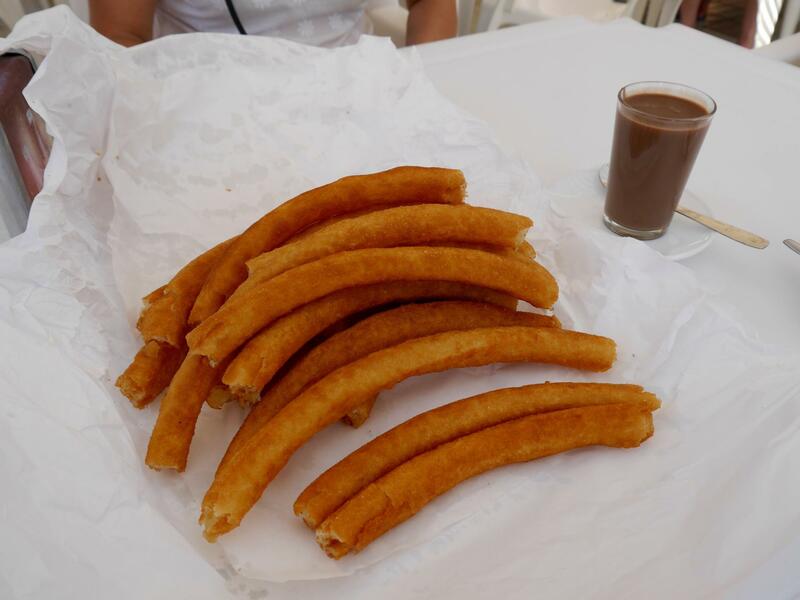 There are a string of Churro cafes along the Playa San Cristobal which you simply cannot walk past without picking up a bag of freshly made sticks of doughy heaven! 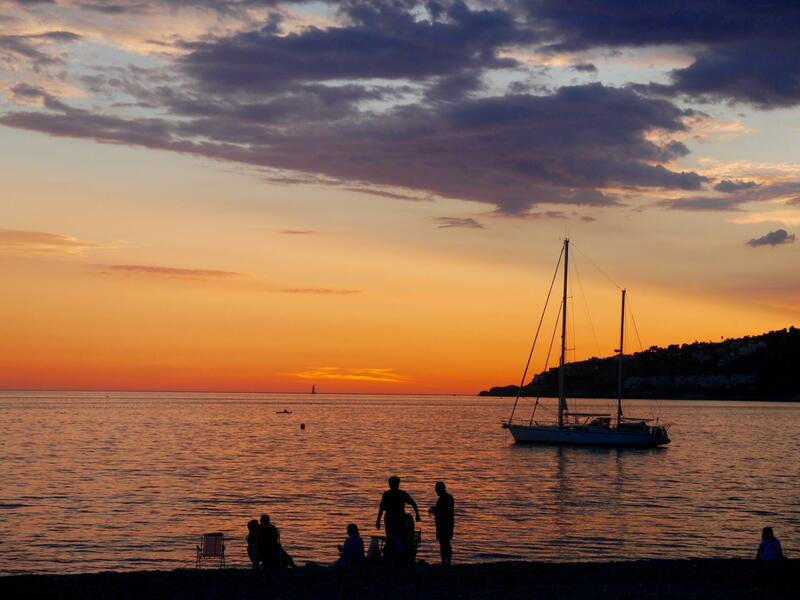 The Playa San Cristobal is the name of Almuñécar’s main beach. Clusters of sunbeds attached to the waterfront restaurants mean you can comfortably lie out on the beach all day close to plenty of amenities. One word of warning I must give is that you shouldn’t expect a white sandy beach. It’s more of a brownish hue with more shingle than sand, but don’t let that put you off. The water is crystal clear and beautifully clean. On the tip of the Playa is the Penon de San Cristobal, a tall rugged cliff face with a huge crucifix on top. 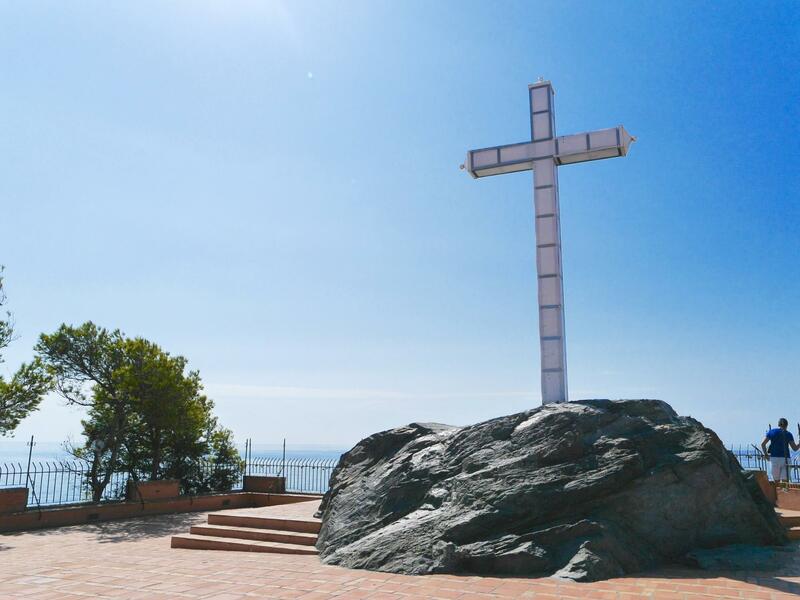 The crucifix can be seen from miles away and is a reminder that Almuñécar is home to a strong catholic community. Think of it as Almuñécar’s statue of liberty. 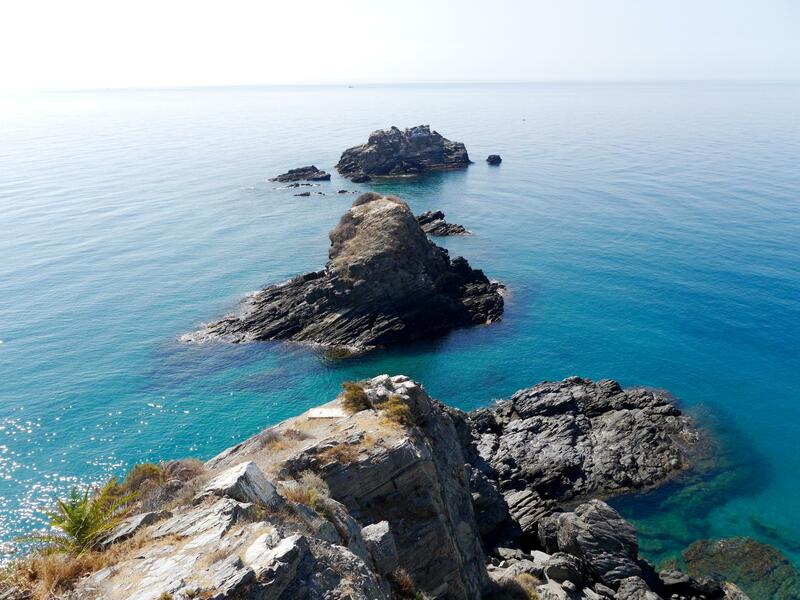 The rocky surroundings are dramatically beautiful and the bright blue waters are stunning. 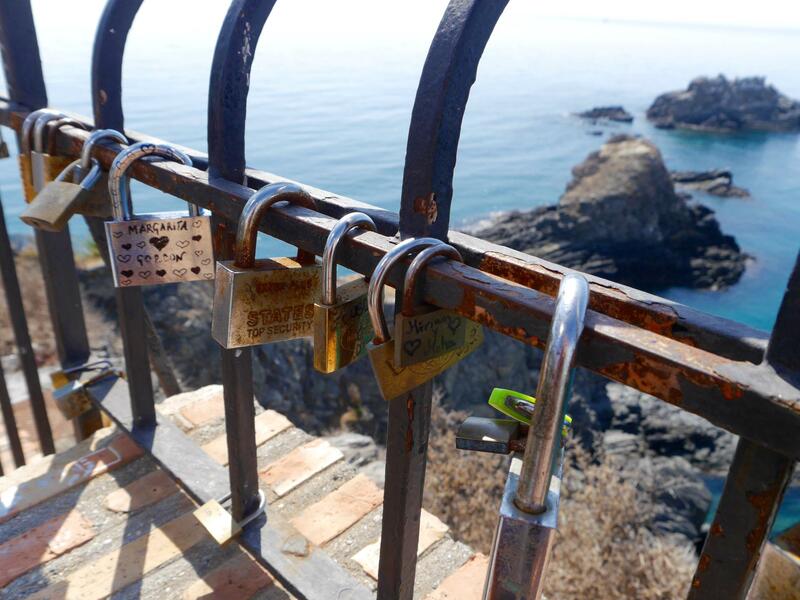 Be sure to take the short climb up the Penon for spectacular views. 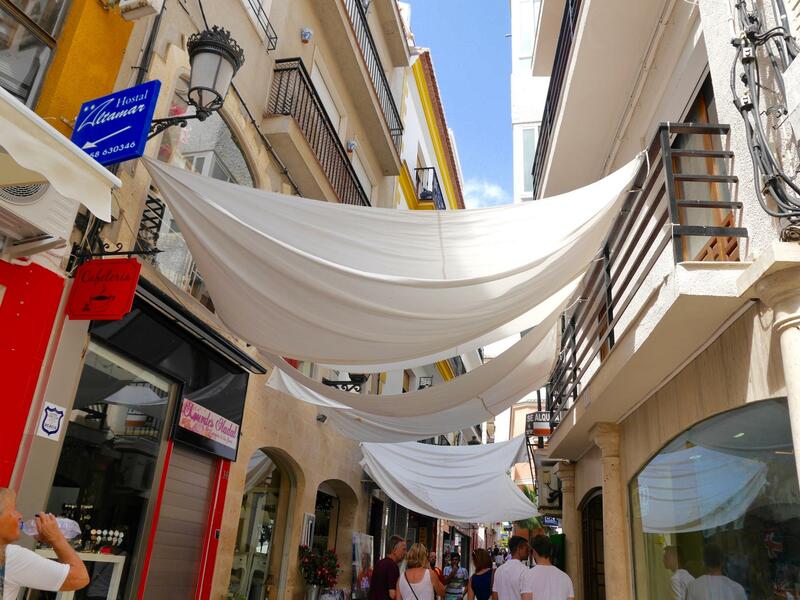 Almuñécar’s old town is a charming labyrinth of winding alleyways that are filled with shops, coffee shops, bakeries, restaurants and eateries. There are, of course, some touristy shops here, but everything feels wonderfully Spanish and buzzing with locals. The alleyways and winding streets are all connected by quaint piazzas that are full of al fresco cafes, perfect for sitting in and watching the world go by. Allow at least half a day to explore the Old Town and get lost amongst the side streets. 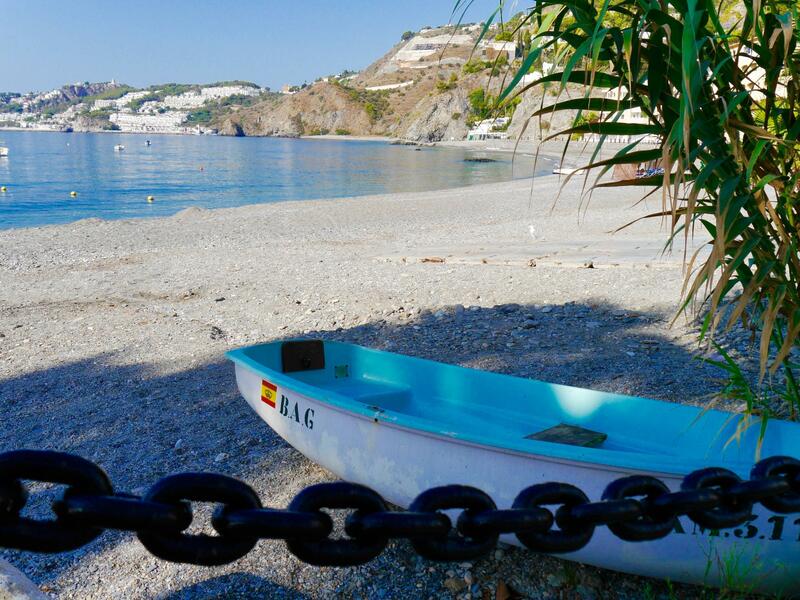 I was considering visiting almuñecar for a week next year and your blog has just totally convinced me. We too are a family that avoid the usual spots if we can and we like to stay where the locals frequent. Thanks for helping me decide ! Brilliant! Having a month in La Herradurra during November and the information and pics are absolutely invaluable, a big thank you!! Really feeling excited about visiting places, beaches and restaurants you recommend. Love living in the Yorkshire Dales but the winter time can be rubbish!! 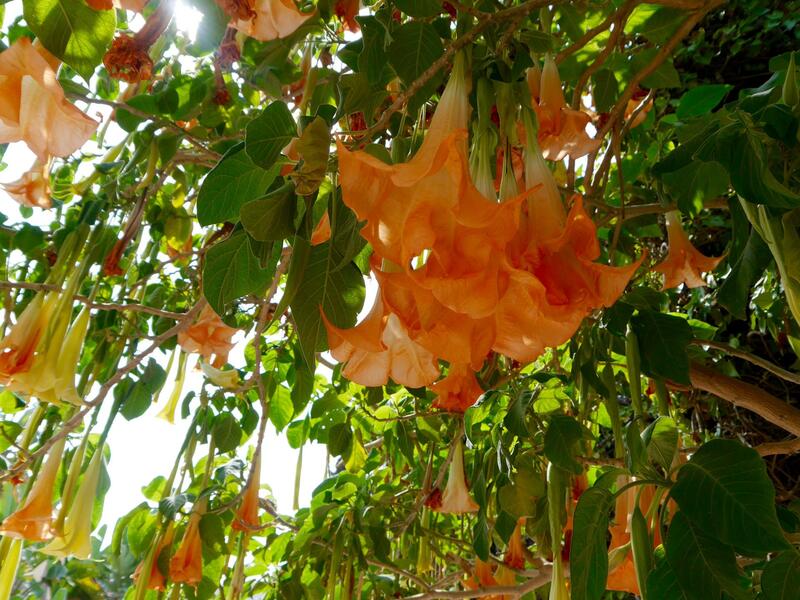 Sounds fabulous..just getting on a bus at the moment from frigilana to nerja and wondering where to visit next time. Got the name on the side of the bus and found your blog. Next holiday sorted..I have to agree the spanish run places are far nicer. Thank you! Hi I am also going to move to from the West Coast. I am interested in talking to you about what knowledge or help you may be able to give me. Love this! We are actually family travel bloggers with our home base in Almuñécar. It is great to see you fell in love with it too and all for the same reasons. Can’t wait to visit in two weeks, thanks for the recommendation and great write up on it! Cudowny opis i zdjęcia. Byłam w Motril i Almunecar i masz rację – małe hiszpańskie miasteczka są cudowne !!! Pozdrawiam serdecznie. If you want you can visit my website about Almuñécar, but don’t tell anybody! Absolutely what a hidden gem! 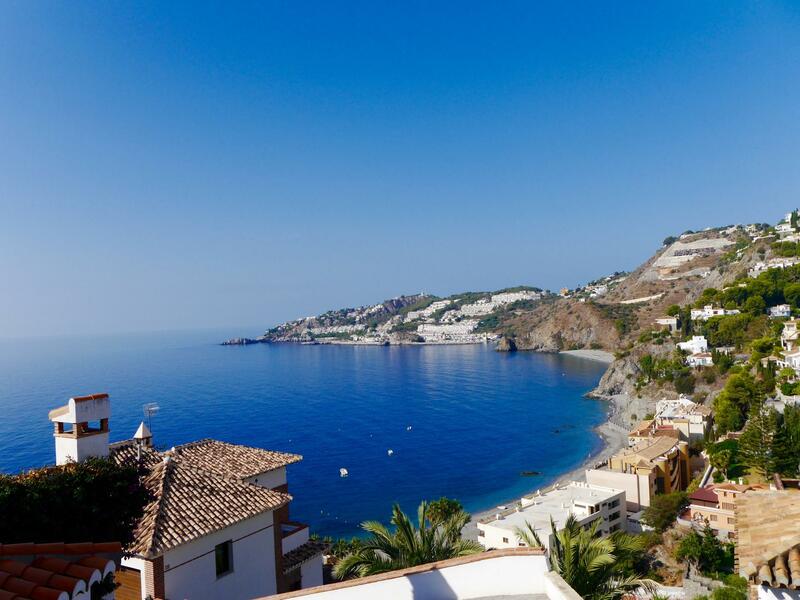 Lovely photos, Jess and a nice summary of the lovely Spanish town of Almuñecar. 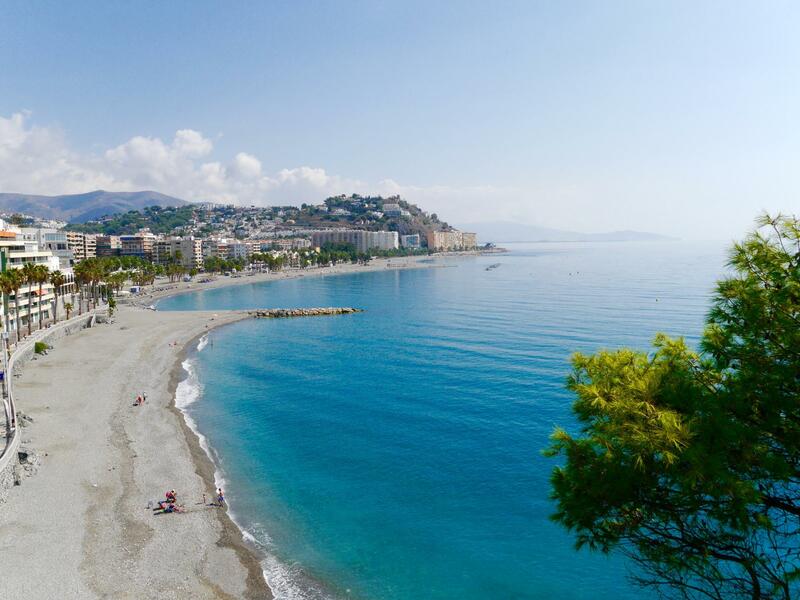 The eastern Costa del Sol (to the east of Málaga city) gets tarred with the same brush as the western Costa del Sol – but they are SO different. The eastern side is much more authentic with fewer tourists too. Hey Jess, I’m taking a 2 week holiday to Spain in February. What was your family’s exact itinerary of this trip? You had me at churros and chocolate! Looks gorgeous. Love the white and black bikini too! It looks so beautiful! I love the buildings, they’re just gorgeous. I haven’t been to Spain for years but would love to go back next summer. wow 🙂 I lived on the east coast of Spain for three months, and this makes me really miss the old town areas of large cities… so beautiful! Fantastic, what a gorgeous place! I am going!